Single Sign-On Express manages all relevant user names and passwords to one handy iView ... at the click of a mouse. Maintain a large set of user-password combinations at your fingertips (Internet and intranet supported). Combining user-specific and enterprise-wide applications in one launchpad allows your users single-sign-on access. Multiple iView deployments (separate / shared application lists) with flexible layout, styling and group settings. Integrate company global user passwords. Access to enterprise accounts without publishing user credentials. SSO Express by Sweetlets compiles all relevant applications of an end-user in a handy iView. Administration of systems, usernames and passwords, happen effortlessly on the fly. Compatibility with upcoming service packs. SAP SDN and many more. Subsequent connections are immediate by leveraging the stored credentials. Easily create even complex scenarios. Leverage content owners to deploy dedicated compilations to specific user groups. Leverage groups to organize applications into logical blocks. Configuration is a breeze. Just step through the intuitive wizard making the process virtually plug-and-play. 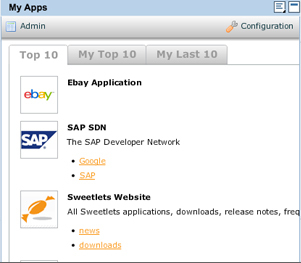 Pricing for all our Sweetlets SAP Portal applications is based on the total number of named users within your SAP Portal. Purchase consists of a one-time license fee along with a support fee paid annually. Change requests: Many of our enhancements are as a result of client requests. If you have something you would like to see in the application purchased, we are always keen to work together to make our products better. Contact support@sweetlets.com support@sweetlets.com with your request for more details. How to Download SSO Express ? Latest release: 2.1.25 on Apr 11, 2014 Note: Please check the PDF “SSO Express 2.1.24 – Changes to apply” when running a version lower than 2.1.24 and want to update. We are always keen to hear from you. Please tell us your ideas or ask any questions you have on your mind. We will certainly help you as best as we can or point you in the right direction. Please contact our team at support@sweetlets.com or call us at +49 89 21 54 77 50 - 0 And no, we are not afraid of criticism or negative feedback. The only way we can make our software better is by listening to you, the user. We firmly believe in our client's feedback and our business relies on it. Most feature enhancements in our products are based on actual client comments and requests. If you are missing something, please just let us know! Pricing for SSO Express is simply based on the total number of named users within your SAP Portal. Purchase consists of a one-time license fee along with a support fee paid annually.